See Detective Derek notes 0711 below. In 1975 with Werner Rauh, Enrique Kamm found a colony of plants growing on rocks near Jacaleapa, Francisco Morazan, Honduras, quite near Tegucigalpa. There is also a colony near the airport. On the same expedition he found Tillandsia hondurensis which Werner Rauh described in 1981. This species is on the endangered list and has nothing to do with the plant here under discussion. Werner did not take any taxonomical interest in the plant with affinities to T. fasciculata. On the other hand, Enrique saw horticultural benefits and he saw similarities with the ubiquitous Tillandsia fasciculata and called his find T. fasciculata var. hondurensis. Over the years he sent specimens to Tropiflora and Dennis Cathcart kept propagating them and selling them as T. fasciculata “Hondurensis”. 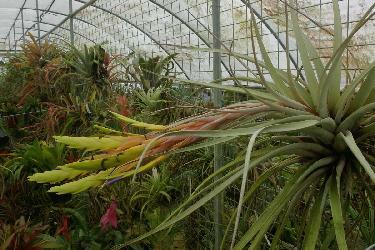 Such is the popularity of this plant it is now being grown in many countries by Tillandsia enthusiasts. Recently a large shipment went to Singapore to be part of their huge ‘Gardens by the Bay’ project. In July 2011 Matthias Asmuss of Venezuela flowered his ‘Hondurensis’ and when he wanted to know more about his plant he could find no reference to this name either in any species listings or the Cultivar Register. This is understandable because nobody had bothered to formally identify this plant. Most striking-looking plants find their way to a taxonomist and eventually get formally identified and sometimes given a new name according to the ICBN rules. This takes time. Here we strike a problem. In 2010 there was a paper published under the heading “Herbaria are a major frontier for species discovery” ( PNAS 107 (51): 22169-22171. 2010) where it was revealed that only 16% are described within 5 years and 84% much much longer. It would seem better that living plants be given a non-Latinised name so they can be released via the nursery trade. 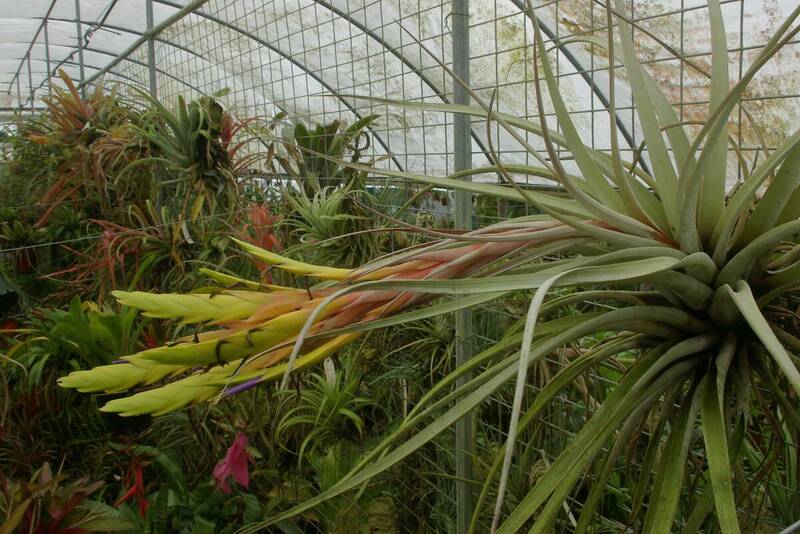 Here the Bromeliad Cultivar Register can play a vital role because crucial data can be recorded. Anyway, Matthias in his zeal for information placed a photo on the Florapix section of Brom-L asking for comments. I was somewhat surprised when Dr Walter Till suggested this may well be the ‘old’ Tillandsia pungens. I knew that it was treated as a synonym of T. fasciculata var. fasciculata in Flora Neotropica (1977) and this had me checking old records. This was what I found in Mez in Das Pflanzenreich, Bromeliaceae 1934/5 : 32. T. pungens Mez in DC. Monogr. Phaner. IX. 684. (1896). Leaves 0.4 m long, above the sheath to 23 mm wide then gradually narrowing to a clearly subulate subpungent tip, when dried involute channelled, white lepidote drying grey. Scape thick, erect, dense very rigid scape bracts, long triangular acute, strongly pungent involute. Floral bracts dense imbricate, the back glabrous becoming smooth, from wide ovate becoming blunt, towards the tip the upper part is very clearly incurved acute carinate, to 50 mm long, very clearly exceeding the sepals. Sepals anterior one free, posterior pair to 23 mm connate, back glabrous with fine prominent veins, lanceolate, very acute, to 36 mm long. Petals 14 mm longer than the sepals, tubular erect, shorter than the stamens. Mexico: Oaxaca, in the Sierra de Misteca, Cerro Potrero (Schenck Mex. n.226). Lyman Smith in Phytologia 20(3): 177. 1970 placed this species under T. fasciculata var fasciculata and this was again published in Flora Neotropica (1979). Nobody has challenged this move in the intervening years. Mez was of the opinion that T. pungens was closer to T. tricolor because its spikes were flatter in cross section. But then, when does flat become convex? Matthias has found that his plant is very close to the description of T. pungens but he would also find it very close the description of T. fasciculata var. fasciculata. Such is the dilemma. Thanks to Matthias Asmuss for asking questions, Dr Walter Till for giving a different slant on the matter, and Dennis Cathcart, so that another cultivar naming problem can be laid to rest!